Sen. Cathy Osten talks about the “soul” of the Democratic Party. From left: Rep. Robyn Porter and Sen. Beth Bye. Gov. 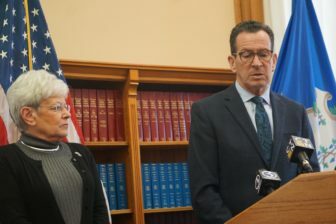 Dannel P. Malloy and Democratic legislators on Thursday outlined similar agendas for the remaining nine weeks of the 2018 legislative session: Pay equity, expanded sick time and other workplace issues largely directed toward women, a constituency that polls indicate has further tilted toward Democrats since the election of President Trump. Pay equity, paid family medical leave, a higher minimum wage and expanding the current paid sick days law were endorsed to varying degrees by the Democratic governor, who is not seeking re-election, and Democratic lawmakers trying to win clear majorities this fall after losing ground to Republicans in three of the past four election cycles. 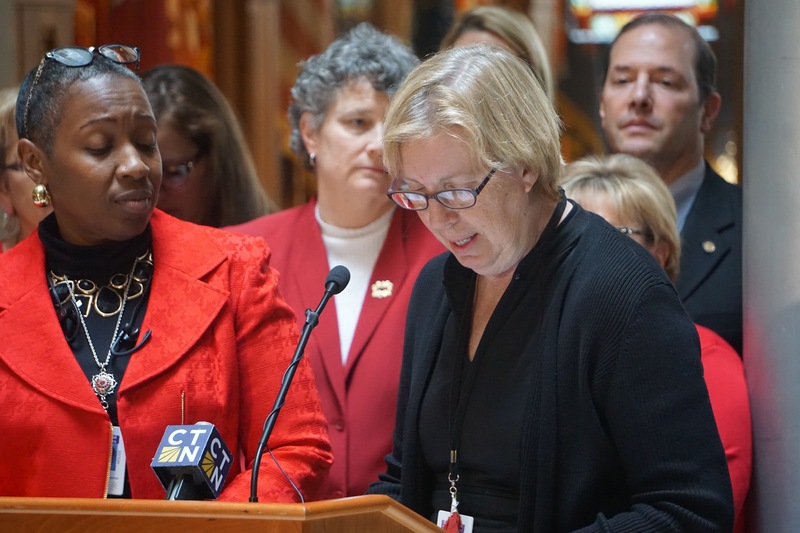 In separate events marking International Women’s Day, Malloy and the legislators promoted bills up for public hearings Thursday before the legislature’s Labor and Public Employees Committee, a bastion of pro-labor proposals that often clear the committee to die without floor votes in the House and Senate. “At our very core, Democrats believe in equal pay for equal work, that no one working full-time should be forced to live in poverty, and that if you, your child or another member of your family gets sick, you should be able to take time off to care for them without an added financial burden,” said Senate President Pro Tem Martin M. Looney, D-New Haven. A similarity at both events was the insistence that the political climate has shifted, giving Democrats a shot at passing progressive bills in a closely divided legislature, where the Senate is evenly split and House Democrats struggle with the smallest working majority in decades. “There is a movement afoot, people,” said Sen. Beth Bye, D-West Hartford. Polling indicates that might be true outside the State Capitol, an encouraging sign for Democrats in the fall. But the mathematics of passing legislation remain difficult, given the GOP’s opposition to increasing the cost of doing business in Connecticut. There is an 18-18 tie in the Senate, where only the tie-breaking ability of Lt. Gov. Nancy Wyman provides Democrats with nominal control of the agenda. House Democrats struggle with the smallest working majority in decades: an 80-71 advantage, meaning the defection of five Democrats on any bill gives the GOP effective control. Gov. Dannel P. Malloy and Lt. Gov. Nancy Wyman. 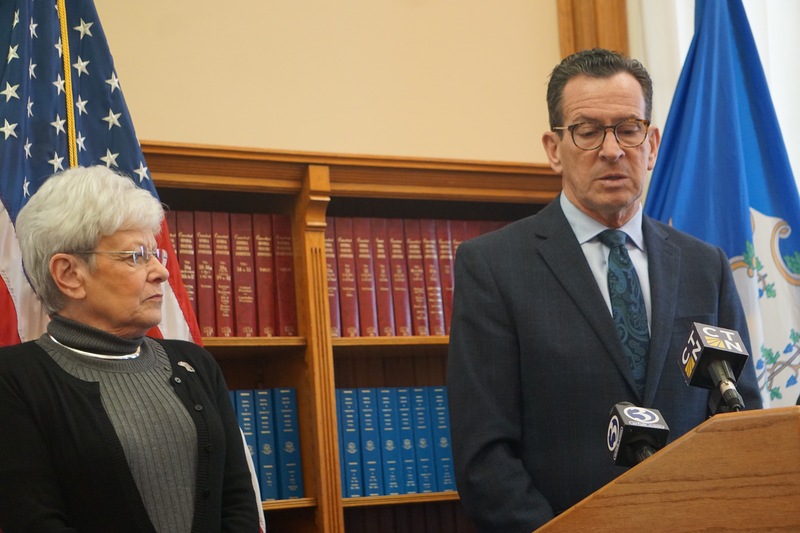 Malloy said he strongly favors raising the state’s minimum wage, but he pointedly refrained from endorsing the goal of labor groups — legislation gradually raising the minimum wage from $10.10 in steps to $15 on Jan. 1, 2021. The governor said he will take a pragmatic approach, saying a smaller increase would be better than none. The legislature has not passed minimum-wage legislation since 2014, and this past January was the first in four years when minimum-wage workers received no raise. The 2014 law raised the state’s $8.70 minimum on the first day of three successive years — to $9.15 in 2015, $9.60 in 2016 and $10.10 in 2017. In 2014, Connecticut ’s minimum wage was the second-highest in New England and fourth-highest nationally. It now lags in the region. New York has a basic minimum wage of $10.40 that is scheduled to increase to $12.50 by the end of 2020, with regional differences, including a $15 minimum wage that takes effect by the end of 2018 in New York City. The minimum is $11 in Massachusetts, $10.10 in Rhode Island (going to $10.50 in January), $10.50 in Vermont, with further increases indexed to inflation. California has a minimum wage of $11 that will increase by $1 annually until reaching $15 on Jan. 1, 2022. The state’s largest trade group, the Connecticut Business and Industry Association, submitted testimony Thursday opposing a bill that would raise the wage to $15 in 2022, then index further increases to inflation. So did small business owners. An expansion of the state’s current requirement that certain private employers offer paid sick days or other time off to employers with 20 or more employees. The cutoff is now 50. A pay equity bill that would bar potential employers from inquiring about a prospective candidate’s previous salary until making an offer of a job. A measure to combat sexual harassment that would require most employers to increase training. House Minority Leader Themis Klarides, R-Derby, reminded the labor committee Thursday that she and some other Republicans support the pay equity measure, hinting that a bipartisan compromise might be possible on an updated version of a bill that cleared the committee last year on a 7-6 vote, but never came to a vote in the House. “Given my strong interest in this issue, I trust you will include me and any interested members of my caucus in the discussions going forward,” she said in prepared testimony. Scott Jackson, the state labor commissioner, said the bills are not anti-business. “Sometimes we forget, or purposefully ignore, that our full economy thrives when both employers and employees succeed,” Jackson said. Ned Lamont, a Democratic gubernatorial candidate, also submitted testimony, saying that the measures would benefit businesses in a tight labor market. “The proposed bills being heard today strive to make Connecticut a state where everyone can benefit from economic opportunity, provide for their families and feel secure in their workplace,” he said.